WHAT ARE YOUR GOALS? NOT ALL ADVENTURES ARE THE SAME. We aim to meet your needs and assist in the pursuit of your goals. You can help by selecting an adventure that is designed to meet your needs. Understanding the spectrum below may help you select the adventure that best suits your needs during the buying process. At Northeast Mountaineering we categorize our guided mountain adventures using an Experiential vs. Educational Spectrum to help you understand the objectives and outcomes of each adventure. 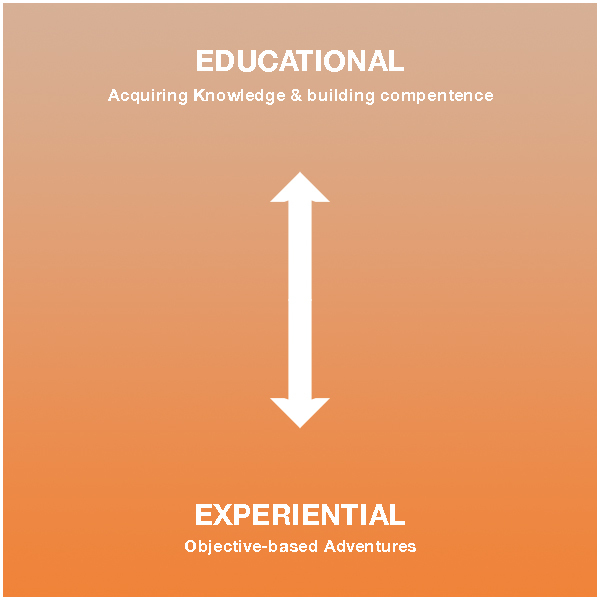 Experiential adventures: are objective-based that often leave little time for education along the way. We may expect our guests to arrive with a certain degree of education or ability or we may provide brief instruction on critical skills in order to safely participate. If you register for adventure that falls within the experiential range you can expect the guides to make many decisions without explanation. Their primary focus is providing an experience that is fun, memorable, objective-based and most importantly, safe. Objectives match the guests ability and outcome desires. Educational courses and adventures: tend to focus on increasing competency, skill sets and acquiring knowledge. They are built to improve the guests ability to safely navigate the vertical world and backcountry on their own in the future or better prepare them to tackle harder objectives with a guide. Guests may arrive with previous experience or they may not and our guides are trained to adapt to meet the demand. Educational courses and adventures will be slower-paced and chock full of learning opportunities. These outings are less focused on objectives or the summit and more focused on sharing and receiving knowledge. Your guides will take the necessary time to thoroughly explain their decisions, teach skills and often times let you practice and/or include you in decision-making process. Venues and objectives are chosen to maximize the learning process. The mountains provide many opportunities and no two adventures are the same. As guides we balance the overall experience and the educational value of each and every outing. Many of the offerings at Northeast Mountaineering are designed to be experiential-based – a guided mountain adventure that you won’t soon forget. Others are designed to be more educational and informative. Every offering is a mix of both and therefore each one falls on a spectrum that has education on one end and experience on the other. Our mission is to to share educational, inspirational & entertaining mountain experiences in New Hampshire and beyond. We specialize in guided mountain adventures for beginners and novices of all ages at the entry level. Our programs are built on education, mentoring and investing time and energy in the development of each climber.